Olivia Ladaire stirs up a winning rice dish. 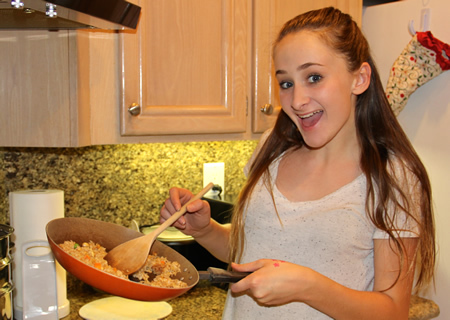 Laguna local Olivia Ladaire last month entered the Ben’s Beginners Cooking Contest, where children are invited to submit a home video of themselves preparing a rice-based dish. Olivia, a student in the culinary arts conservatory at Orange County School of the Arts in Santa Ana, was chosen as one of 25 finalists for preparing Livvey’s stuffed zucchini with marinara sauce. Top winners will receive $15,000 in cash, a hometown celebration that includes a celebrity chef and a $30,000 cafeteria makeover for their school. Watch the cooking videos and vote for Ladaire at: bensbeginnerscontest.com.